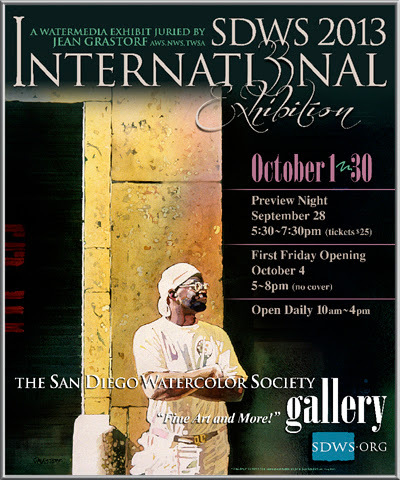 San Diego Watercolor Society 33rd International Show! I'm so pleased to have my painting "Orchid" juried into this prestigious show here in San Diego, California. There are many International and National award winning published artists in this show which humbles me. Tonight is the Pre-awards show, so I'm keeping my fingers crossed but it will be an opportunity to meet with these artists that I have long admired. Even if I don't happen to win anything, it is truly an honor to be included in the show and it may just give me the nudge to enter shows in national shows and other states. If you live in San Diego, be sure to catch the show while it's here at Liberty Station throughout the month of October! Today is the first day of school for the kids here in San Diego County and that means less crowds everywhere including the beach!!! Time to take my "Tommy Bahama" beach chair, snorkel & fins, sketch book and art magazines and enjoy the surf and sun! I enjoyed meeting many of the artists and listening to their personal stories of how they became artists and how they approach their art work. I hope to go again next year in Florida. I'll be participating in several art events this month with the first being the Coronado Art Walk on September 14 & 15th. It'll be the first time I will make a go and actively sell my art, but I can only participate as a colored pencil artist only. Maybe next year, I'll have or share a booth were I be a mixed media artist and sell all mediums of my art. For now, it'll be baby steps and a big learning curve for me. I'm happy to say I made the cover of the marketing poster and am one of the featured artists. 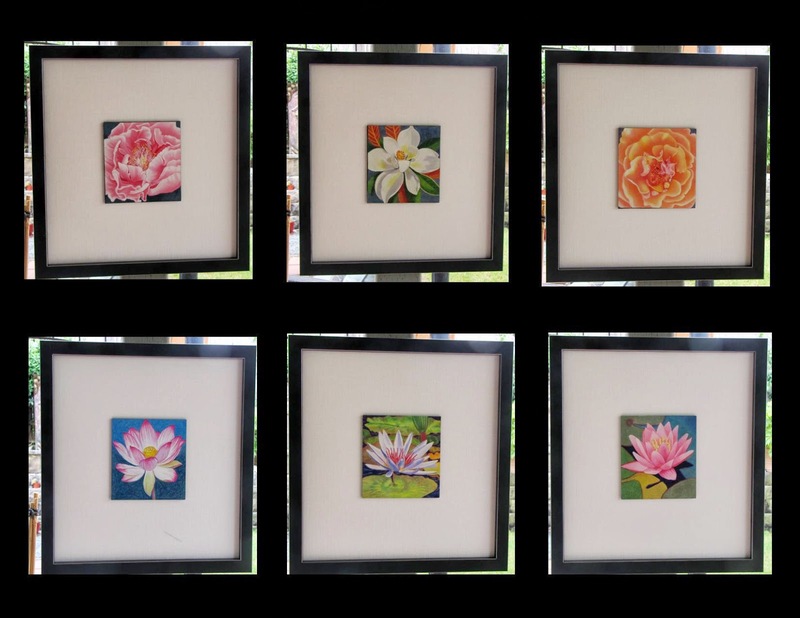 I did about nineteen 5" x 5" colored pencil art of flowers and mounted it on gesso board. It was heavily varnished giving them a "tile" appearance. I had to pick out 10 for the fancy black square frames with white linen backdrop, the rest will have have simple stained wooden frames. Here's a sample of the black frames. I will be by the ferry landing with 3 other wonderful colored pencil artists - Susan Salazar, Deb Gargula, and Teresa Ross. I hope to see you there!